Situated at the heart of the delightful Stirlingshire countryside, Auchensalt and Easter Borland Farm is an attractive compact mixed farming unit on sale through our National Farm Sales Centre. The holding runs to 199.92 acres (80.91 Ha) of good quality Grade 3 arable and grazing ground, with approximately 145 acres of the farm currently down to rotational grass and permanent pasture with a further 45 acres cropped annually. The land is situated in two blocks, lying on either side of the A783, which links the villages of Thornhill and Blairhoyle. Auchensalt Farmhouse sits peacefully at the end of a private access track, in an elevated position and commands stunning panoramic views overlooking the Carse of Stirling. The farmhouse is an attractive stone built dwelling providing well-proportioned family living accommodation arranged over two floors. Outside, the garden surrounds the house and provides an attractive backdrop for the property. The front area is largely laid to lawn with a small area of gravel edged with herbaceous borders and shrubs providing a delightful mix of colour with a stunning outlook to the south and east. The fields are primarily south facing and are well served from the centrally located farm steading and can be accessed via the private farm drive or directly off the main public road. 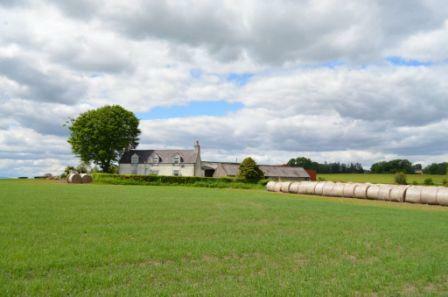 Duncan Barrie, who is handling the sale for CKD Galbraith, said: "Auchensalt and Easter Borland Farm provide useful block of self contained farmland is situated in a desirable location within central Scotland. The property benefits from good access and excellent links to nearby Stirling, with Glasgow and Edinburgh within less than an hour's drive. "It is anticipated that the property will potentially attract considerable interest from local farmers looking to expand their existing farming arrangements and benefit from economies of scale, but also from non-farming interests as some investors may seek alternative opportunities given the financial markets are still cautious and lenders are being very selective." Offers over 800,000 are being invited for Auchensalt and Easter Borland Farm. Find out more about this property.